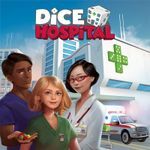 A family friendly game, you are the manager of a hospital in charge or receiving, treating and discharging patients. Acquire new specialised wards to increase the usefulness of your hospital and recruit new specialists to aid the treatment of your patients. This is the Kickstarter release and includes all stretch goals and exclusives. It also includes the Deluxe box which contains additional game content and the five resin ambulances and dice tower.